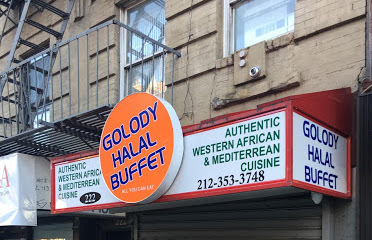 Over at Eater, Robert Sietsema visits Golody Halal Buffet at 222 First Ave. (between 13th Street and 14th Street) in his latest Cheap Eats series. Choices include popular dishes from Senegal, Guinea, Cote D’Ivoire, Ghana, and Nigeria, and the selection changes daily. The cashier told me, for example, that a fermented cornmeal mash from Ghana called kenkey would be available on Wednesdays ... The day I went, there were several types of rice available, and a Guinean sauce de feuilles made with sweet potato leaves, a Nigerian okra sauce dotted with beef, and a Senegalese chicken yassa ... It helps to know this food already, but you’ll do quite well just loading up your plate with things that look good to you. The cost is $5.99 per pound, which is a great deal. Sounds like a much more interesting cheap eats option than the previous tenant here — the $1 slices of Joey Pepperoni. Golody is indeed cheap, friendly and delicious. Ate there around 4:00pm today. Delicious, cheap, and actually a lot of fun since it's filled with West African bike delivery guys who are playing their home-country music from their phones and the whole place is chatting like they're old friends.